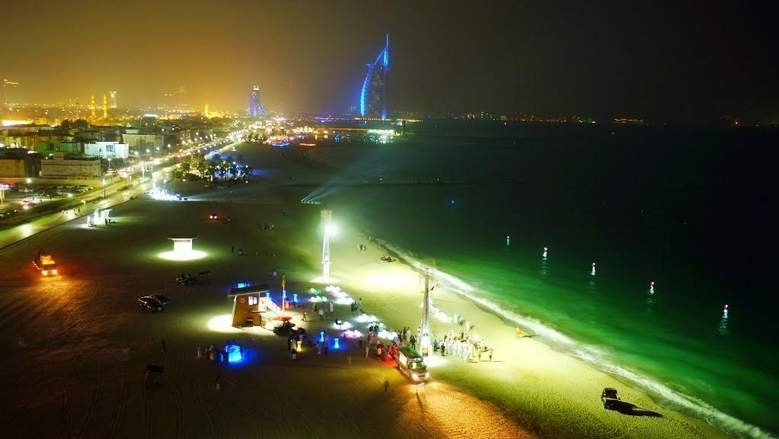 As part of its vision to make Dubai a happy and sustainable city, Dubai Municipality has launched the first public beach in the region dedicated to night swimming in Umm Suqeim-1, which is just a kilometer away from the Burj Al Arab Hotel. It is considered to be the first of its kind in the world due to its smart and environmentally friendly design as it relies only on clean energy generated from wind and sun. The initiative offers Dubai residents and visitors the opportunity to have a unique and pleasant experience to enjoy a night swim in the Gulf waters, in a safe environment equipped with all the elements and requirements of security and safety. Eng. Hussain Nasser Lootah, Director General of Dubai Municipality said two solar and wind-powered smart poles have been installed on the beach that will automatically provide high density light and smart changing rooms that generate electricity using solar and wind power. He added that this initiative is a continuation of Dubai Municipality’s efforts to improve the emirate’s public beaches and provide smart services that support the Government of Dubai’s plan to transform the emirate into a smart city, such as the Smart Palm Initiative, which provides Internet and clean electric power that has been well received by beach goers. Lootah added that as part of Dubai Municipality’s keenness on the safety of beach visitors, it usually does not allow swimming at night on the beaches. “However, this initiative was in response to the desire of a large segment of the public who would like to enjoy swimming at night especially in the summer, when the temperature goes up during the day time,” he said. Eng. Alia AbdulRahim Al Harmoudi, Director of Environment Department highlighted the most important aspects and advantages of the smart poles. “The smart poles were installed at a height of 12 meters, which light the side of the beach up to a width of 120 meters and a depth of 50 meters inside the sea water. Each pole can generate about 1.5 kW of electricity per day from a combination of wind and solar energy. The poles are made of weather resistant reinforced fibers, making them suitable for installation in the coastal environment. In addition, the poles are equipped with sensors that enable them to light the beach automatically after sunset,” she said. “Smart poles are equipped with digital screens to display marine warnings in case of sea disturbance. The texts of the marine warnings and the colors of the flags usually flying on the beaches to warn the swimmers will be scrolled on the screens. When the redlight shines, it indicates the danger of swimming and its impossibility,” she said. Harmoudi said that the night beach will be operated until midnight and has been provided with a main rescue station and a qualified crew of rescuers equipped with all safety, rescue, ambulance and communication equipment, as well as beach and water rescue bicycles that ensure a safe environment for beach visitors. She said that the initiative is expected to have a significant positive impact on raising the public happiness rate in addition to supporting the tourism movement as the public beaches represent a major destination for the visitors of Dubai. She noted that the initiative will be evaluated during the coming period and determined the public interest in it, in order to study its popularization on other beach sites in the emirate.